Vernon Archibald. Popular tenor ballad singer Charles Harrison formed the American Singers Quartet around 1927, with tenor Redferne Hollinshead, bass Frank Croxton and baritone Vernon Archibald. 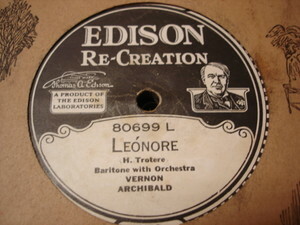 Archibald recorded several solo and duet songs for many different companies, but he mostly recorded for Edison Records. Vernon Archibald, a baritone from Chicago, gave a matinee of songs and airs in Italian, French and English yesterday at Aeolian Hall, his first in public here, though he sang once in private last year. A dramatic air of Verdi’s “Simon Boccanegra,” was hardly contrasted in performance with that of Handel which preceded it, or the ensuing “Legend of the Sage” from Massenet’s “Jongleur.” There was sensitive appreciation in his delivery of lyrics, such as Cornelius’ “Monotone,” Mrs. Maley’s “In a Garden,” a poem of the Christ-child, and Miss Brown’s “Sunset,” an unpublished air, with “A Ballynure Ballad” and others in conclusion. To listen to recordings by Vernon Archibald, or other early recording artists, visit the Cylinder Preservation and Digitization Project at the University of California Santa Barbara.